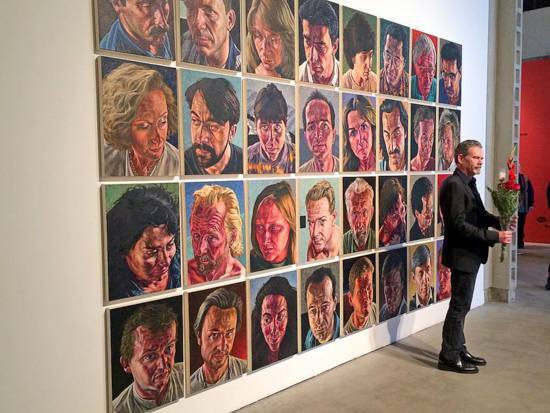 What a year Los Angeles artist F. Scott Hess is having: his works are simultaneously on view in a two-part retrospective, and a one-man gallery show. His deadpan historically-themed mockmentary and curio cabinet The Paternal Suit: Heirlooms from the F. Scott Hess Family Foundation is gradually making its way from the deep South to the West Coast. Hess is the subject of a feature article in February's Juxtapoz, and a ten-page spread in a Polish art magazine: since he doesn't read Polish, that has been a bit frustrating. 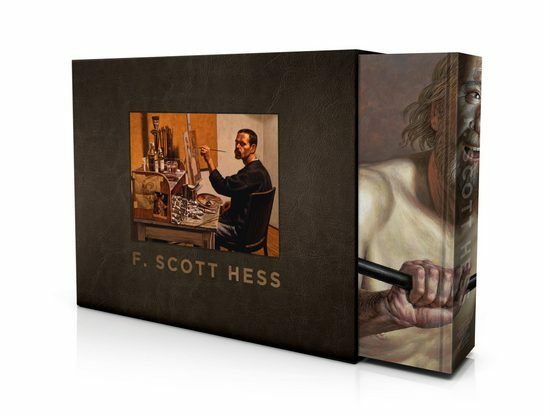 A 200 page F. Scott Hess coffee table monograph is due out this fall. 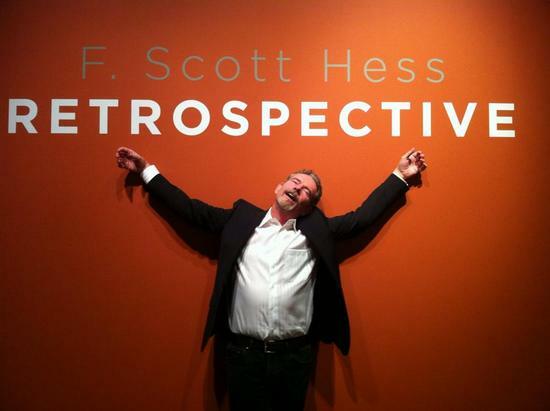 It all seems to be coming together in a kind of perfect storm: in fact, Scott has been calling 2014 the year of the Hess-storm. Committed to narrative and representational painting since the start of his career, Hess has always seen himself as standing outside the periphery of the official Art World. "I didn't play their game," he has written: "I didn't deal with issues the Art World felt important. I didn't work in forms and mediums that were of the time." 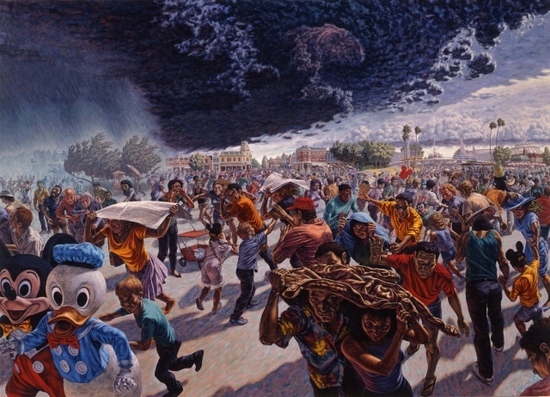 Instead of "playing the game" Hess has been painting brilliant and darkly funny paintings, building friendships, teaching and serving as a beacon to an upcoming generation of representational artists. In recent years he has used social media expertly and hit the max of 5,000 Facebook friends a long time ago, and he uses the "like" button fearlessly. Scott is a great painter," says his friend and fellow artist Marc Trujillo, "and in addition to the example he provides in rigor of his work he's also been really generous and helpful with his contacts. He puts me in touch with people and we compare notes about everything." As this year's Hess-Storm demonstrates, all the effort that has paid off in both his personal and professional spheres. "Scott is responsible for a resurgence of narrative in painting," says curator Mike McGee, "A lot of younger artists have come along since (Scott) and felt empowered to tell stories." 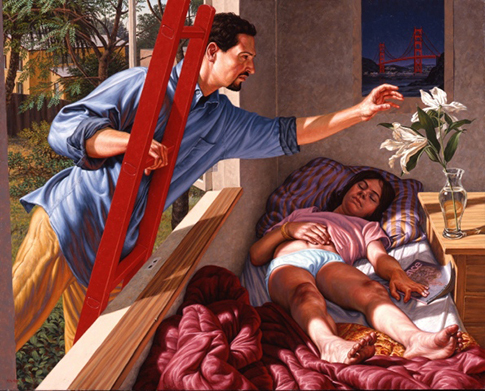 One of his new paintings from 2014 -- Lift at Koplin Del Rio -- is a trenchant and enigmatic masterpiece that needs to be seen in person to be appreciated. It features four naked figures -- two men and two women -- who hoist a hippo skull against a sky that illuminates its interior with a flecks or golden-orange light. Scott says it was designed to have "multiple meanings" and to be seen as alternately "religious, cultish, evolutionary or mystic."